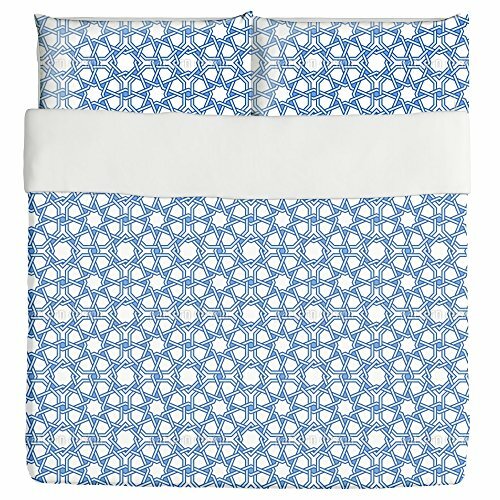 Keep your bedroom in style with uneekee\'s custom-printed duvet covers. King Size - 104" x 88", Queen Size - 88" x 88", Twin Size - 68" x 88", Pillow Shams - 20" x 30"
easy clean - Machine wash on cold. Tumble dry on low. Design By Svitlana Chestnykh, patterndesigns.com Arabic latticework pattern design. custom printed - uneekee custom prints each item for you - and we will gladly accept any returns for print or manufacturing issues, including all shipping fees. for any other reasons, uneekee will charge a re-stock fee. shipping and return shipping are not covered by uneekee, unless we\'ve made an error. if you need to match a specific color, we can do that! simply email info@uneekee.com and we\'ll work with you and make an exact match! View More In Bedding Sets & Collections.